Recording a CD or a DVD necessarily requires that during the process an application creates an ISO image or compiles the files that we want, nevertheless, on many occasions we don't want to burn the disc immediately, or we may even only want to use it in a virtual unit. For these cases, Magic ISO Maker will allow us to generate those ISO files easily. 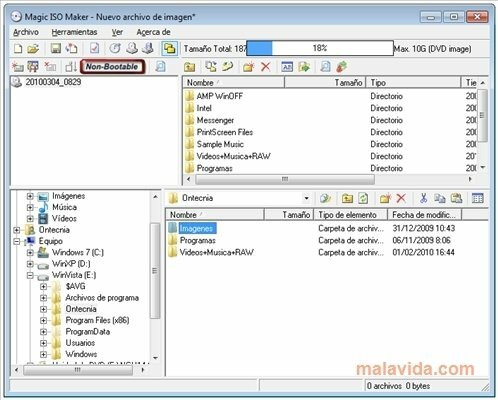 Once open, Magic ISO Maker allows us to choose the files that we want to save in the ISO image from an interface that is similar to that of Windows Explorer. On the top part we'll see the percentage of a CD or DVD that we're using, so that we'll be able to know if we'll be able to burn the project on to a disc at a later date. Furthermore, Magic ISO Maker also allows us to generate a bootable disc, so if we have any kind of software that may require this feature, we'll be able to generate the disc correctly. And as a final strong point, Magic ISO Maker allows us to access different utilities that will allow us to use virtual units, compress or convert formats, that is a thoughtful gesture on behalf of the developers.